Samsung issued an alert to customers on Monday, asking users to immediately turn off their Galaxy Note 7 smartphones -- which have been spontaneously catching fire. In a corporate statement, Samsung said it will also "ask all carrier and retail partners globally to stop sales and exchanges of the Galaxy Note 7" while it investigates the cause of the fires. 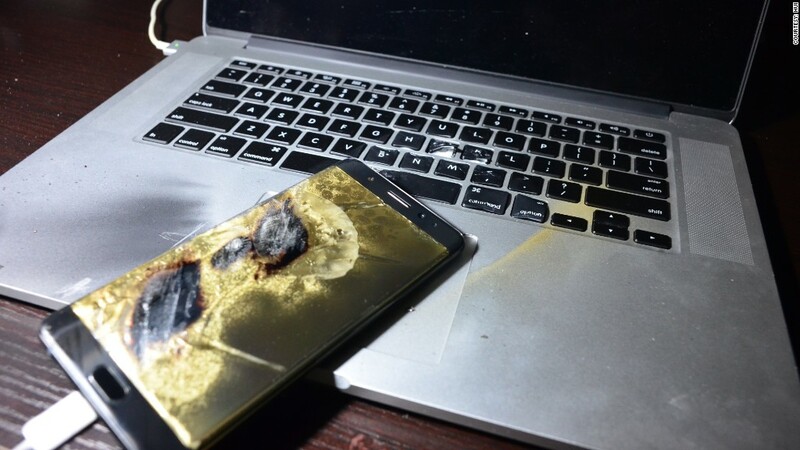 It also said, "Consumers with either an original Galaxy Note 7 or replacement Galaxy Note 7 device should power down and stop using the device." It's a major setback for the South Korean electronics manufacturer. The company's stock plunged more than 5% Tuesday morning in Seoul. Samsung (SSNLF) released the 5.7-inch Galaxy Note 7 device in August in anticipation of Apple's new iPhone 7. But customers immediately started complaining that their phones were catching fire. The company explained that faulty lithium-ion batteries were overheating the device and causing it to ignite. In early September, Samsung recalled 2.5 million devices worldwide. Samsung offered replacement phones -- but those burst into flames too. The U.S. Consumer Product Safety Commission is investigating the incident on the plane. U.S. safety regulators and Samsung urged Galaxy Note 7 customers in early September to "immediately stop using and power down" the original Note 7 phones. Now, Samsung is issuing a similar warning for the replacement devices that were supposed to be safe. On Monday, Consumer Product Safety Commission Chairman Elliot F. Kaye said Samsung made "the right move." "No one should have to be concerned their phone will endanger them, their family or their property," Kaye said in a statement. The Federal Aviation Administration issued a warning to air travelers last month, asking them to keep their Galaxy Note 7 phones turned off, not to charge them and "not to stow them in any checked baggage." It updated its warning on Monday, saying it applies to the replacement devices, too. Samsung said that customers who shut down their phones can "take advantage of the remedies available." According to U.S. federal regulators, consumers are entitled to "a full refund."